Successfully Added PC to TV Converter - Use Your TV As A Computer Monitor to your Shopping Cart. 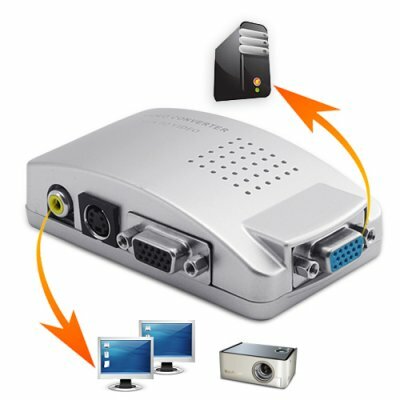 With this powerful PC to TV converter you can use your big screen TV to watch movies from your PC, browse the internet, or simply to use as your primary or as a secondary computer screen. If you enjoy downloading movies, playing video games, or watching Netflix online, then you will definitely enjoy being able to it all from the convenience of your big screen TV! This easy to use PC to TV adapter comes with a VGA IN connection and S-Video out, RCA (yellow) out and VGA out. The image adjustment controls are conveniently placed on the side of the device so you can quickly adjust the picture quality for any brand TV. The device is plug-and-play ready so you can just connect it to your TV and use it immediately without any software installation necessary. And to make things even better, this device works on all operating systems including PC, Mac, and Linux! If you ever wanted to use that beautiful TV as a computer screen then this is the right product for you. The G250 is compatible with all TVs that use a RCA or S-Video connection, and all computer monitors that use a VGA connection. The G250 is quick and easy to use and comes with everything you need to get started instantly. And don’t forget, the G250 comes with our famous 12 month guarantee and is in stock now and ready for next day shipping. For best results adjust the resolution on your computer to match your TV. Also, you will need to use the menu system from the PC to TV converter to adjust the color and sharpness in order to achieve the best picture quality. Can I use this adapter with a high definition TV? Yes, but it will only display video in standard definition, not high definition. Because you have not adjusted the picture on the device. Go to the menu and adjust the sharpness and color settings until the picture looks clear. Does this product extend my desktop or mirror it? It will only mirror whatever is on your current desktop. Does this product also support audio output? No, It only supports Video output. Do I need any software to install this product on my computer? No, It is a plug and play device, no software installation is required. I recently bought a new video card and i had 2 dvi and 1 svideo out and my new one dont have the Svideo output witch is for my 3rd monitor ( a TV ) and i was searching for a cable to split a dvi or hdmi to RCA or SVideo and i found this. I just copy my second Videocart DVI both on monitor and TV with this converter and it is EXACTLY want i expected and the best is at a cheap price. Thanks Chinavasion, Again for all your Great products. the picture quality isn't what i expected but the price is right for what you get. service from Chinavasion is very good product was as described and shipping very fast.